You won't find a more iconic place to stay than Sydney's Bondi Beach, so why not stay in Bondi Blue, a spacious apartment privately set away from the bustling beach but only a few minutes’ walk to get there. Superior in design, location and inclusions, this casual Bondi beauty is positioned moments from where the city meets the sea. Embrace coastal living on the sand with this ultra-spacious rental, located near-beachfront on a prime stretch of the eastern coastline, this lifestyle holiday home captures a sense of surf, sand and sunrises from its modern interior. With three bedrooms containing seven beds, this holiday home can comfortably accommodate up to eight guests. Showcasing coastal chic, Bondi Blue excels in collaborating the modern finishes with the casual seaside vibe of this suburb and, with your daily comforts included with unlimited Wi-Fi, Netflix and coffee machine or cross the road to the local cafe strip, the choice is yours. 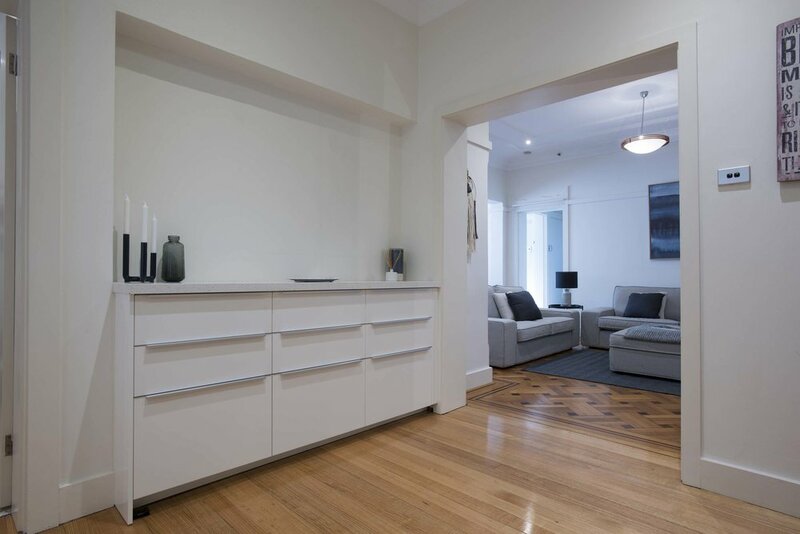 The apartment is a classic mix of white and blue and contemporary art to every room. You will love the light bright open-plan theme where the gourmet kitchen is complete with stainless-steel appliances and the large television in the living room. Set moments from the sought-after sandy stretch of Bondi your first impression of this holiday rental will not disappoint. 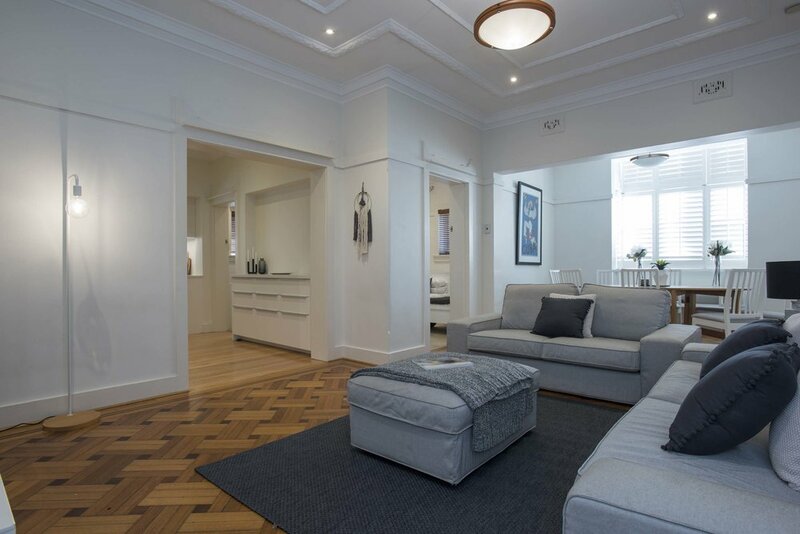 Positioned perfectly one street back from the esplanade you're only a few steps from basking in the beauty of Bondi beach, famous for its world-renowned surf break, iconic culture and stunning Bondi to Coogee cliffside walk. If you are looking for ease and luxury, a short five-minute walk will take you to it all, with award winning restaurants, bars, cafes, boutique shops, patrolled beaches, or lunch, swim and sauna at the prominent Bondi Icebergs. The home has been designed for a group that really loves to live and take full advantage of Bondi Blue’s coastal surroundings, you can enjoy the ocean breezes and the sound of the surf from the comfort of your bedroom. 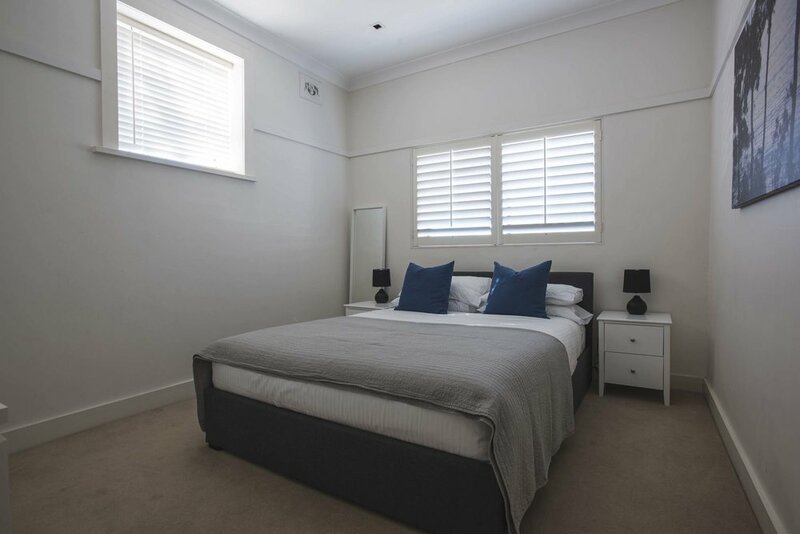 The ultimate in coastal holiday home, only ten minutes from the city centre and ten minutes from the main retail and transport hub of Bondi Junction, you can’t beat the convenience or charm of a stay at Bondi Blue. Bedroom 3 - One Single + Bunk beds. Maxium 5 adults and 3 children. Bunk beds & floor mattress are not suitable for adults. garage height is very low so large SUVs will not fit in garage. Approx. 6 steps to front door. Not suitable for guests with mobility issues.